Andy Devereux invites Nancy, Ned, and Bess to a sailing regatta near his family’s estate in Annapolis, Maryland. Andy is the co-owner of a boat-designing company, and he all but guarantees that his boat will win the cup. But his hopes—and his life—are suddenly blown off course when the police arrest him for murder! Andy’s partner, Nick Lazlo, has vanished at sea, his boat stained with blood and riddled with bullet holes. Nancy’s investigation into the company reveals that the business had a strange and unsavory side—both personally and financially. In a case of missing money, missing boats, and missing bodies, the most dangerous discovery of all may be the truth! Wow! 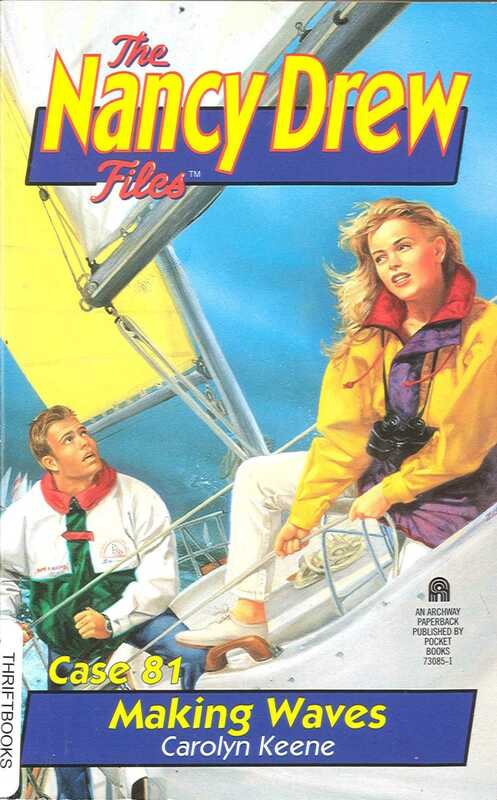 A cruise on a sailboat," Bess Marvin said to her friend Nancy Drew. "That's my idea of a perfect spring vacation!" She spoke loudly to be heard above the wind and tried to keep her blond hair from flying everywhere by holding it in a ponytail with one hand. The two girls were in the backseat of a white Cadillac convertible with the top down. In front, Bess's new boyfriend, Parker Wright, and Nancy's longtime boyfriend, Ned Nickerson, were talking to Parker's cousin Andy Devereux, who was driving. Andy and his parents had invited Parker, Bess, Nancy, and Ned to stay with them in Annapolis, Maryland, over the boys' spring break from Emerson College. As the Cadillac sped down the Baltimore-Washington Highway on the way from the airport, Nancy couldn't help feeling excited. Not only were they on vacation, but they were going to help Andy sail his new boat, the Skipper's Surprise, in an upcoming regatta, the first sailboat race of the Annapolis Spring Series. "It's not exactly a cruise, Bess," Nancy said. The wind had whipped Nancy's reddish gold hair into tangles, but the salty air felt invigorating. "If we're going to help crew Andy's boat for the race, that means 'trimming the mainsail' and 'grinding the jib.'" Bess made a face. "You can trim and grind all you want. I'm going to put on my new bikini and get a tan." Nancy laughed. She knew Bess had spent days picking out the perfect bathing suit, even though Nancy had warned her that Maryland spring weather would be too chilly for sunbathing. "When we race, I'll mainly need you guys for ballast," Andy called over his shoulder. In his midtwenties, Andy had the same reddish hair and athletic build as his cousin Parker. Parker grinned and turned around to look at Bess. "Ballast is something heavy to help steady the boat and keep it balanced," he explained. Bess tapped him on the shoulder, a look of mock anger in her blue eyes. "Parker! Are you calling me heavy?" "No way! You're perfect, Bess Marvin, and you know it." Parker's green eyes twinkled as he ran a hand through his thick hair. He and Bess had been dating only a short while, but Nancy could tell they really liked each other. "Nancy and I both have some sailing experience," Ned reassured Andy. The wind had ruffled his brown hair into waves. Nancy was glad the two of them were finally getting to spend some time together. Her last case had been grueling for all four of them -- Parker had been falsely accused of murdering a teaching assistant at Emerson College in a case Nancy called Power of Suggestion. Nancy was glad for the chance to really relax now. Andy nodded. "Good. Nick Lazlo, my partner, is the skipper of the Skipper's Surprise. He'll be happy to have experienced sailors to crew. After a while, family and friends get sick of racing." "You and Nick have a sailboat-building business, right?" Nancy asked, leaning forward in the back seat. Parker had told them a little about Andy's business during the flight to Maryland from the Midwest. "Right. It's called Lazlo Designs," Andy re plied. "Nick's the designer. I handle the sales and business end. Nick's got some great ideas that we're trying out on the Skipper's Surprise. In fact, the Surprise is our prototype for a new line of boats we're calling the Nican Forty. If she performs as well as we hope in Sunday's race, we'll start manufacturing the boats this summer. " "And make a fortune," Parker finished for his cousin. "I've seen the plans for the Nican Forty. She's going to be comfortable, fast, and beautiful." "I get it!" Bess exclaimed. "Nican. You took the first three letters of Nick's name and the first two of yours, Andy, right?" "Not only is she cute, but smart, too!" Parker said, shooting Bess a teasing smile. Andy chuckled. "This is the Severn River," he announced, steering the Cadillac onto a bridge. Nancy glanced down at the wide expanse of calm brown water. After crossing the river, Andy turned onto a road that ran near the river. Fifteen minutes later, he was steering down a long drive flanked with azaleas, rhododendrons, and holly trees. "Aunt Julie and Uncle Robert are happy to have all of us stay at their place," Parker told Ned, Nancy, and Bess. "They get lonely with Andy working all the time." "They're not going to be lonely today," Andy said. "I forgot to tell you guys -- they're throwing a big preregatta party later this afternoon at the house." "Sounds great!" Nancy said. A moment later, she straightened as the Devereux' house came into view. The stately three-story white brick mansion was set back from the road. A huge expanse of sweeping lawn led up to the house. Andy pulled around the circular drive and stopped in front of marble stairs that led to a pillared porch. "Wow," Bess gasped. "I feel as if I died and woke up as Scarlett O'Hara in Gone with the Wind." Laughing, Nancy climbed out after her friend. Ned was already helping Andy and Parker unload the suitcases from the trunk. "Parker, why don't you take Ned around to the guesthouse where you'll be staying?" Andy suggested. "Bess, you and Nancy will be in the south wing here at the house. That way you'll be able to look out over the river." The four teens made plans to meet up in the house before the party. Then Nancy and Bess followed Andy up the porch steps. When they stepped inside, Nancy stopped short, exchanging an amazed glance with Bess. The marble-tiled foyer was about the size of her entire living room back in River Heights, Nancy thought. A crystal chandelier sparkled over her head, and ornate gilt mirrors surrounded her on two sides. In front of her, a mahogany stairway spiraled to the second floor. Before the girls could comment, an attractive middle-aged woman with stylish silver-streaked blond hair came walking into the foyer from a hallway beyond the stairs. She was wearing a casual skirt and blouse and deck shoes. "You made it," the woman said, giving the girls a welcoming smile as she approached them. "I'm so pleased you could come." "Aunt Julie, meet Bess and Nancy, friends of Parker's," Andy introduced the girls. Nancy shook the older woman's hand. "We're glad to be here, Mrs. Devereux. Your house is beautiful!" "Thank you." The older woman beamed at the compliment. "Sorry my husband isn't here to greet you, but he's out supervising the caterers. The party starts in an hour, so you might want to settle in before the guests start arriving. " Bess and Nancy thanked her, then Andy led the girls up the curved staircase. An Oriental runner stretched the length of the upstairs hall way. Andy stopped at the second door, opened it, and waved the girls inside. "Wow! Is this a room or a museum?" Bess exclaimed. Andy laughed as he set down Bess's suitcase. "Both. My parents collect antiques." "It's really beautiful," Nancy said, looking around. There was a mahogany bed on each side of the room. In the middle was a sitting area of four wing chairs, all flanking a marble fireplace. Ornate mirrors hung on the walls, and double doors led to a balcony overlooking the back lawn. "Don't forget, the party starts in an hour," Andy reminded them. "I'll see you then." After he left, Nancy walked over to the balcony doors. She pushed them open and stepped out side. A large striped tent had been raised on the lawn below, and a band was setting up on a patio by the pool. Several white-coated men and women were running around with chairs, glasses, and trays. A short man with steel gray hair wearing a cardigan and white slacks seemed to be directing the workers. Nancy guessed he must be Parker's uncle Robert. Beyond the tents, the landscaped yard sloped gently down to the banks of the Severn River. Nancy could see the guesthouse where Ned and Parker were staying. To the left of it was a long dock with two boats moored to it. "Pinch me, so I'll know if I'm dreaming," Bess said as she came out to stand beside Nancy. "You're not," Nancy assured her friend. "Then I'd better find something to wear to the party," Bess said, surveying the activity on the lawn. "From the look of it, this is going to be some blow-out!" "That afternoon the wind was blowing so hard and the rain was coming down so heavily that I couldn't see or hear a thing! It's a wonder we didn't run aground." Nancy sat forward in her poolside chair, fascinated by the sailing story that Nick Lazlo was telling her, Bess, Parker, and Ned. Nick was already there when the teens had gone out to the lawn an hour earlier. After Nancy, Bess, and Ned had met Andy's father, they'd been introduced to Nick Lazlo. Since then, they hadn't stopped talking to him. Nancy thought Nick looked every bit the sailor. Tall, lean, and handsome, he already had a dark tan, and squint lines surrounded his light blue eyes. He was dressed in white denims, a long-sleeved blue denim shirt, and deck shoes. "So what did you do?" Bess asked breathlessly. She leaned forward, smoothing the skirt of her pink minidress. Nick shrugged. "We pulled down the spinnaker, reefed the mainsail, and won the race! But only because most of the other boats got lost or quit," he added with a chuckle. "Uh, are you girls ready for lobster and crab cakes yet?" Parker interrupted. He and Ned were standing behind Nancy and Bess, holding plastic cups of punch. Nancy jumped up from the lounge chair she'd been sitting on. "Oh, sorry. I'd almost forgotten about food." "Me, too, if you can believe it." Bess added. "But now that you mention lobster . . ."
"You guys better sample the Devereux' great food, then," Nick suggested. "I'm glad I'll have you along to crew on Sunday," he added. "Hey, maybe we should take the Skipper's Surprise out for a trial run tomorrow. We can pack a picnic and make a day of it." "Sounds like fun," Bess and Nancy chorused. Nick crossed his arms over his chest and glanced around. "Now I've got to find some rival skippers so I can razz them about how I'm going to win the regatta." He strode off in the direction of the tent. "He's got some wild stories," Parker said. "It's no wonder, though. Nick and Andy have both been sailing since they were kids." "Mmm," Ned said distractedly, glancing toward the buffet tables. "Let's get something to eat and then enjoy the band." "Good idea," Nancy agreed. "How about if I get some drink refills?" She started to gather her friends' empty cups. "I'll meet you at the buffet." As they started toward the tent-covered bar area, Ned took two of the cups so he could hold her hand. "Ah, alone at last," he whispered. Nancy stood on tiptoe to press a quick kiss to his lips. "Sorry if I got preoccupied by all those racing stories. The people here seem really serious about Sunday's race. " "Mm-hmm," Ned agreed. "Maybe we're not expert enough to crew for Andy and Nick. After all, it isn't just the race they want to win, they also want the publicity and recognition for their boat." "I was thinking the same thing," Nancy said as they approached the bar. When she handed the glasses to the bartender, a loud voice behind the tent caught her attention. "The Surprise is going to be so far ahead, you won't be able to catch her," Nick Lazlo was boasting. Nancy put a hand on Ned's arm. When he turned to look at her, she held a finger to her lips and nodded toward the back of the tent. "Oh yeah, Lazlo? Just wait," another voice growled. "Your Nican Forty's no big deal." Nancy's eyes widened at the person's angry tone. "I'm sick of listening to you boast that you're going to beat everyone, Lazlo. In fact, I'll do anything to make sure you don't win. Anything!"